Organizational accidents have multiple causes involving many people operating at different levels of their respective companies. Such accidents result from ‘latent organisational failures’ that are, according to Reason, like pathogens that have infected the organisation. A key challenge for an organisation’s Safety Management System (SMS) is detect latent pathogens before they cause harm. PBR needs to give the regulator assurance that the organisation’s SMS is vigilant and effective at doing that. Since most of these are procedures, processes, and programs railroads should already have in place, the railroads would most likely only have to identify and describe such procedures, processes, and programs to comply with the regulation. Metro-North has for many years had an SSPP [System Safety Program Plan] that presumably will fulfill the proposed regulatory requirement for such a program. However, while the NTSB investigations found Metro-North had a written SSPP, its implementation was very limited and represented little more than a paperwork exercise. Few Metro-North employees even knew the program existed. The identified deficiencies in the Metro-North SSPP implementation provide a cautionary example to FRA as it finalizes the proposed regulation. A management systems approach will require cultural change at the [regulator] as well as in the industry. The US Federal Aviation Administration (FAA) is has introduced their own Part 5 Safety Management System (SMS) requirement Part 121 carriers (as we discussed in June 2015) so the NTSB have issued a timely reminder. We have however previously expressed concerns that the FAA’s fondest for fines may undermine that implementation. …the first SMS audit to assess the effectiveness of the company’s safety management processes took place in 2010, which was 7 years after the company was found to be in compliance with the SMS Regulations. During this audit, inspectors were informed that the SMS had not yet been implemented because the company was awaiting regulatory approval. TC then clarified with MMA [Montreal, Maine & Atlantic Railway] that TC does not approve a railway’s SMS. Although TC inspections identified problems at MMA between 2003 and 2010, and it was clear to TC that MMA’s SMS was not effective, no SMS audits were conducted in that time frame. The 2010 TC audit determined that MMA had not implemented its SMS. The limited number and scope of SMS audits that were conducted by TC Quebec Region, as well as the absence of a follow-up procedure to ensure MMA’s corrective action plans had been implemented, contributed to the fact that systemic weaknesses in MMA’s SMS remained unaddressed. An organization with a strong safety culture is generally proactive when it comes to addressing safety issues. MMA was generally reactive. There were also significant gaps between the company’s operating instructions and how work was done day to day. This and other signs in MMA’s operations were indicative of a weak safety culture—one that contributed to the continuation of unsafe conditions and unsafe practices, and significantly compromised the company’s ability to manage risk. When the investigation looked carefully at MMA’s operations, it found that employee training, testing, and supervision were not sufficient, particularly when it came to the operation of hand brakes and the securement of trains. Although MMA had some safety processes in place and had developed a safety management system in 2002, the company did not begin to implement this safety management system until 2010—and by 2013, it was still not functioning effectively. While a move towards SMS has great potential to enhance safety by encouraging operators to put in place a systemic approach to proactively manage safety, the regulator must also have assurances of compliance with existing regulations, particularly for operators that have demonstrated a reluctance to exceed minimum regulatory compliance. In order to assess regulatory compliance, and hence whether risks are sufficiently mitigated, inspectors must have appropriate processes and carry out detailed inspections of actual operating procedures and practices. The current approach to regulatory oversight, which focuses on an operator’s SMS processes almost to the exclusion of verifying compliance with the regulations, is at risk of failing to address unsafe practices and conditions. If TC does not adopt a balanced approach that combines inspections for compliance with audits of safety management processes, unsafe operating practices may not be identified, thereby increasing the risk of accidents. Of course the organisations discussed above should be the rare exception. A key to PBR is directing regulatory attention to the weaker organisations with marginal compliance, poor systems and weak cultures before an accident. Prof Sidney Dekker comments on the danger that an SMS can become a “self-referential system”: a system that just exists for itself and is a sponge for data but one from which intelligence never emerges. UPDATE 19 August 2016: Canadian KA100 Fuel Exhaustion Accident This accident highlights important human factors, competence and regulatory oversight issues. Safety Intelligence the various sources of quantitative information an organisation may use to identify and assess various threats. Safety Wisdom the judgement and decision-making of those in senior positions who must decide what to do to remain safe, and how they also use quantitative and qualitative information to support those decisions. UPDATE 31 December 2016: TC has imposed C$409k of civil penalties in 2016. 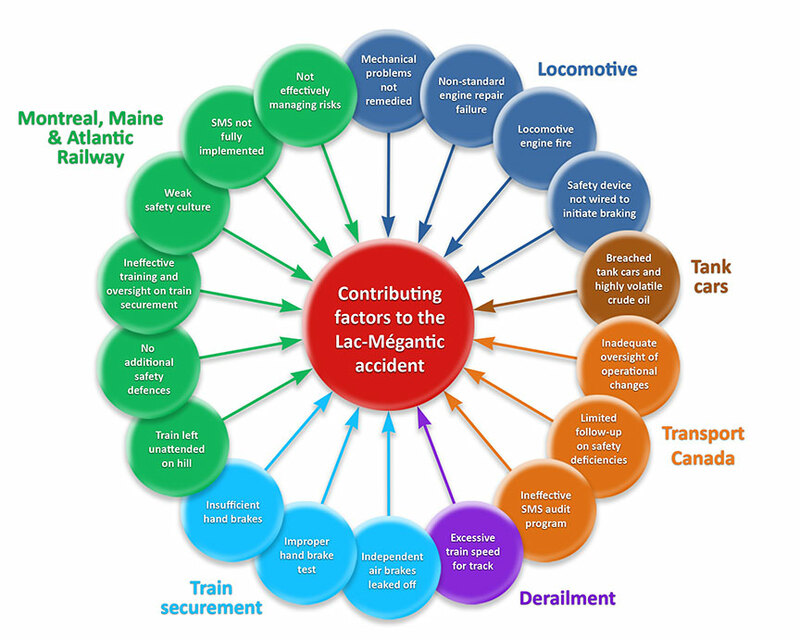 UPDATE 6 January 2018: Despite the organisational and regulatory issues at Lac-Megantic identified by the TSB, three workers were tried on 47 counts of criminal negligence causing death. After nearly three months of emotional courtroom proceedings and nine days of jury deliberations, three former employees of Ed Burkhart’s now-defunct Montreal, Maine & Atlantic Railway were found not guilty of all charges arising from the 2013 Lac-Mégantic oil train disaster. On the night of the disaster, it is likely that if only one of the management decisions had been different, or if only one of the equipment conditions had not been present, the trio of railroaders would have never been in a courtroom. If only operations manager Dematrie had not dismissed the July 4, 2013 report by engineer Francois Daigle that 5017 was belching black exhaust plumes. If only 5017 not been rewired in a way that violated TC safety regulations. If only 5017 had not caught fire. If only an MM&A employee with air brake system knowledge had been sent to check on the train after 5017’s fire had been extinguished. The testimony of MM&A’s former safety and training supervisor provided an unflattering portrait of MM&A management. Michael Horan was on the witness stand for six days. During one particularly rigorous cross-examination, Horan told the court he had no formal training in safety education, had no budget, and needed prior authorization to use his company credit card. MM&A had implemented its SMS in 2002. However, TSB stated TC never audited MM&A’s SMS until 2010, and that other prior inspections showed “clear indications” the SMS was not working properly. 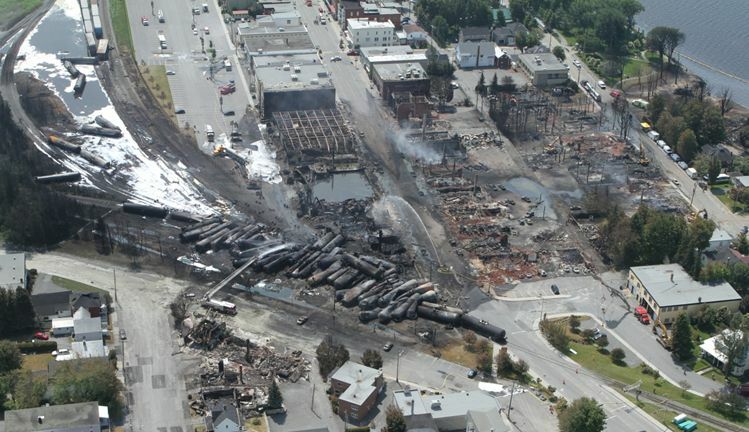 One of those clear indications was the discovery by Canadian investigators of another improperly secured MM&A oil train on July 8, 2013, while Lac-Megantic’s downtown was still smoldering. Since human performance cannot be completely prescribed, some degree of variability, flexibility or adaptivity is required for these future systems to work. Invest in manager skills to build a trusting relationship at all levels. Explore ‘work as done’ with an open mind. Shift focus of development activities onto ‘how to make things go right’ not just ‘how to avoid things going wrong’. Harness the power of ‘experts’ to help develop newly competent people within the context of normal work. Recognise that workers may know more about what it takes for the system to work safety and efficiently than your trainers, and managers. UPDATE 16 February 2018: Quebec’s Director of Criminal and Penal Prosecutions will not appeal the not-guilty verdicts reached by the jury on the three rail workers in the accident. UPDATE 3 April 2018: Lac-Mégantic disaster: No criminal charges will be filed against MMA. It appears difficult to pursue a company under Canadian law if no employee has been convicted, though in this case only front line staff were prosecuted. UPDATE 28 July 2018: Performance-based regulations have changed oversight responsibilities: When it comes to regulating the aviation industry, focusing on an organisation’s performance can pay large safety dividends, says Stephanie Shaw, the UK CAA’s Head of PBR. UPDATE 9 February 2019: Meeting Your Waterloo: Competence Assessment and Remembering the Lessons of Past Accidents No one was injured in this low speed derailment after signal maintenance errors but investigators expressed concern that the lessons from the fatal triple collision at Clapham in 1988 may have been forgotten.